Product descriptions and images are undeniably crucial to online sales, with a vast majority of shoppers naming them important (30%) or very important (63%) to their decision-making process, according to a product information report by Shotfarm. The ideal word count for a product description depends on the type of description you’re creating. Basic descriptions should be kept to one paragraph for reasons covered in our recent blog post on essential product descriptions. Some retailers support descriptions that are longer than one paragraph and include images. This type of content, often referred to as “enhanced content,” is what we’ll focus on in this post. Where do you find enhanced content? These product descriptions are usually “below the fold”. Amazon refers to these enhanced descriptions as A+ content. Shoppers who scroll down to the detailed product descriptions are clearly interested in learning more about a product. If you make the product description too short, they may decide to look elsewhere for information. Still, overly long descriptions can result in information overload. It’s important to think about your shopper’s situation – are they pressed for time and ready to buy, or are they contemplating an expensive purchase and in need of detailed information? Is the product something they’ve bought before, or is it a novelty item that needs some explanation? When choosing a length, brands should focus on the product features that are most likely to benefit the consumer. And although some repetition of those features in the product description can be useful with today’s short attention spans, it’s important to make every word count. In general, a length between 350 and 400 words should be sufficient to address the main features and benefits of a product without under- or over-serving the consumer. Complicated consumer electronics often need longer descriptions, but sticking to a word count of under 600 is best. At over 1000 words, this product description for an Olay Pro-X Microdermabrasion Plus Advanced Cleansing System buries important information in a sea of repetition. And while a longer product description may be appropriate for this product (to alleviate anxiety among those who are interested in skin exfoliation but have never tried microdermabrasion), the extra length is only useful if it adds value. Instead, the description tells us more than seven times that the product produces a brighter, more even skin tone. It describes the brush’s three speed settings six different ways and waits until 700 words in to define microdermabrasion. Shoppers would be hard-pressed to find useful information quickly in this product description, and those reading every word would be annoyed rather than educated. While less may sometimes be more, in the case of this Playtex tampon page, it’s not. At a mere 52 words, the product description comes across as fragmented and disjointed. There’s no opening paragraph to provide a product overview, nor any headers to call out and separate the various features. And while the main features are clearly stated (with an emphasis on design and convenience), the benefits are hardly expounded upon. This is a missed opportunity to explain the difference between this product and those from similar competitors to help quell concerns the consumer may have. 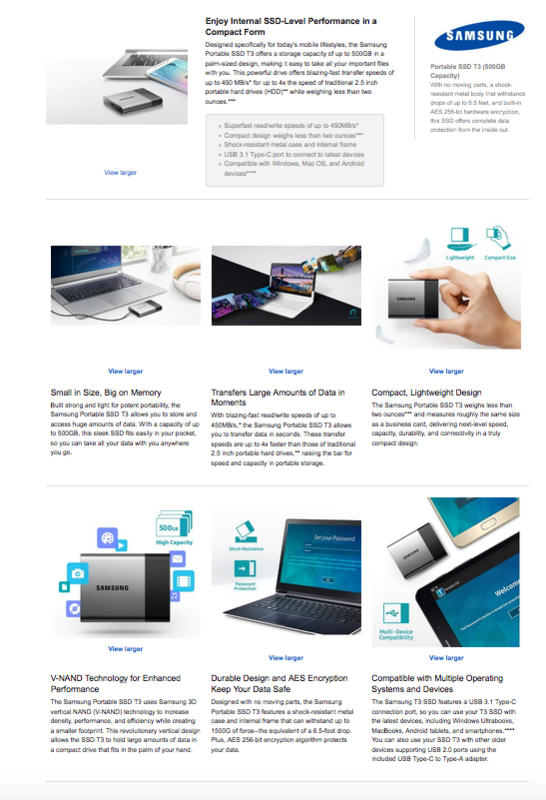 This Samsung portable hard drive product description gets the length just right. The hard drive is a complex product that costs up to $800 depending on storage size. That’s not an everyday purchase for most consumers, so chances are they are looking for some detailed information to give them the confidence to buy. At roughly 450 words, the description concisely focuses on six main features and benefits, each separated by brief, yet informative headers. The writing is succinct and to the point, adequately explaining the primary aspects of the product without sacrificing helpful information or getting bogged down in extraneous details. Retailer requirements for word counts: Many ecommerce sites have their own minimums and/or limits for word counts. Be sure to research the requirements before you start. Provide enough information to concisely address the main product features and benefits: Anticipate what questions or concerns a consumer may have on key (though not all) product aspects. SEO value: If your description is too short, you’re likely missing out on the opportunity to populate your content with valuable search terms. Design requirements: Balance your word count with at least two or three product images and ample white space for easy readability. Getting length just right in your product descriptions can go a long way in presenting your products in the best light. Don’t shortchange consumers by sacrificing important information or overwhelm them with repetition or excessive product detail.